My boyhood friend Roger has a resume that’s as gold-plated as gold-plated gets. Honor student in high school (please don’t ask if I was, too). Ditto in college (I told you not to ask). First in his class in law school. Practiced law at a big firm for about 20 years. Then Roger was appointed a judge in New York State. He has been hearing cases — and tolerating overwrought attorneys — ever since. But in a couple of weeks, Roger will be 76 years old. That means he must retire by the end of 2019, by state law. I ran into Roger at a party recently. He was his usual bubbly self. But when I asked him about his mandatory retirement, it was as if a cloud had formed over his almost-bald head. “I don’t want to retire. I don’t need to retire. I’m not ready to retire,” he told me, with a grimace. However, the geniuses in the New York legislature don’t want to hear any of that. They arbitrarily set 76 as the mandatory retirement date for judges. No wiggle room. No appeal. What’s the rationale behind that mandatory retirement age? The same tired arguments I’ve been hearing since I was knee-high to a Perry Mason re-run. Tiredness Number One: No judge is as good at 76 as he used to be. Tiredness Number Two: Roger and his age mates need to clear out so they can give younger judges a chance. Tiredness Number Three: Forcing Roger off the bench will save the state money. Tiredness Number Four: New judges will be less set in their ways, and more likely to rule impartially. Tiredness Number Five: Roger is a white male, and justice should be administered by more people of many colors and both sexes. Tiredness Number Six: If there’s no retirement age, judges could try to sit even when they’re 100. Not good for justice. And the final Tiredness, Number Seven: Because of mandatory retirement, Roger can soon do all those fun things he has always wanted to do. Snorkeling! Shuffleboard! So, what’s the answer to Roger’s awkward position? The answer that many other industries, and many other courts, already have in place. Instead of being forced to go from 60 to zero in the blink of an eye, Roger (and all 76-year-old judges) should be offered step-down retirements. Maybe 50 percent of their usual caseload the first year. Maybe 30 percent the year after that. Maybe less. Maybe more. Maybe Roger would accept a pay cut. Maybe he’d accept a smaller set of chambers. Maybe he’d give up a fulltime law clerk. It’s all negotiable. It’s all possible. Under phased-in retirement, Roger’s experience would still be available to the public. At the same time, governors could appoint their supporters, minorities could get greater representation — and perfectly capable 76-year-olds wouldn’t be scratching their nearly bald heads, wondering why they are being treated like the problem instead of like the solution. 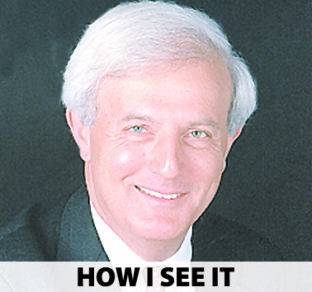 Bob Levey is a national award-winning columnist.